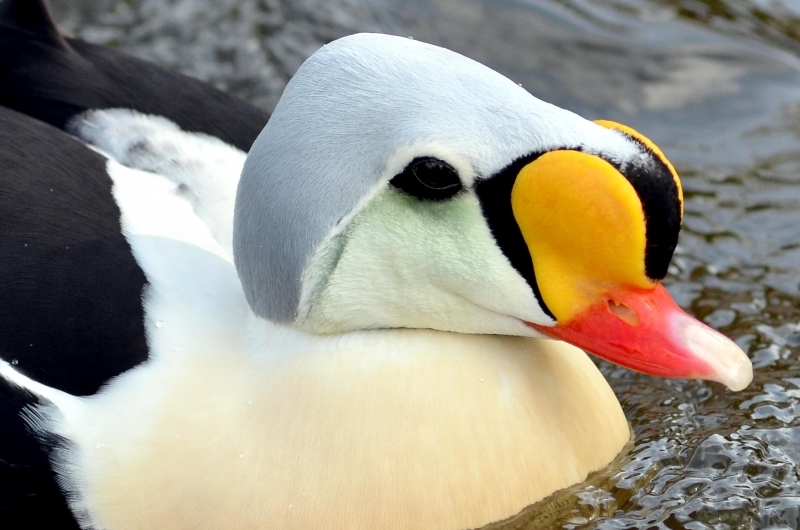 The King Eider is the largest sea duck in the northern hemisphere, measuring in at about 22 inches and is named as a direct translation of its Icelandic name. It is called “king” because of the orange, crown-like knob above the male’s bill; the male’s multicolored plumage also suggests royal robes. 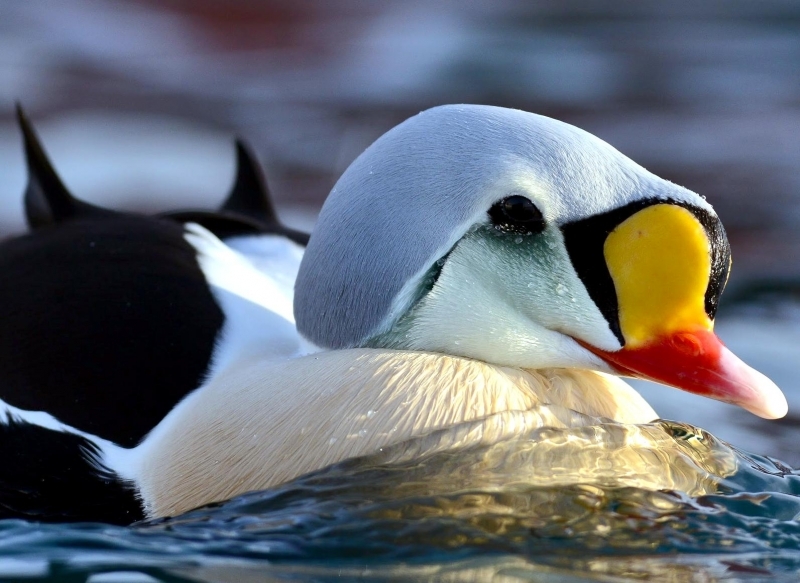 “Eider” is a Dutch, German or Swedish word derived from the Icelandic word “æður” (meaning eider), itself derived from the Old Norse “æthr”. 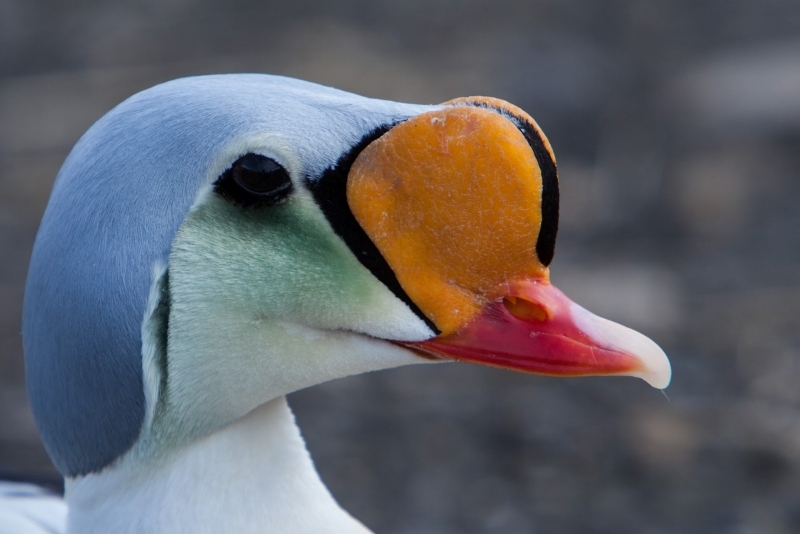 The male has oblong-shaped head and a relatively small red-orange bill with a large yellow-orange frontal shield which is outlined in black which forms an obvious knob on his forehead. The crown of his head and the nape of his neck are gray-blue. The male has greenish cheeks outlined in black and he has a pinkish-white throat & chest. 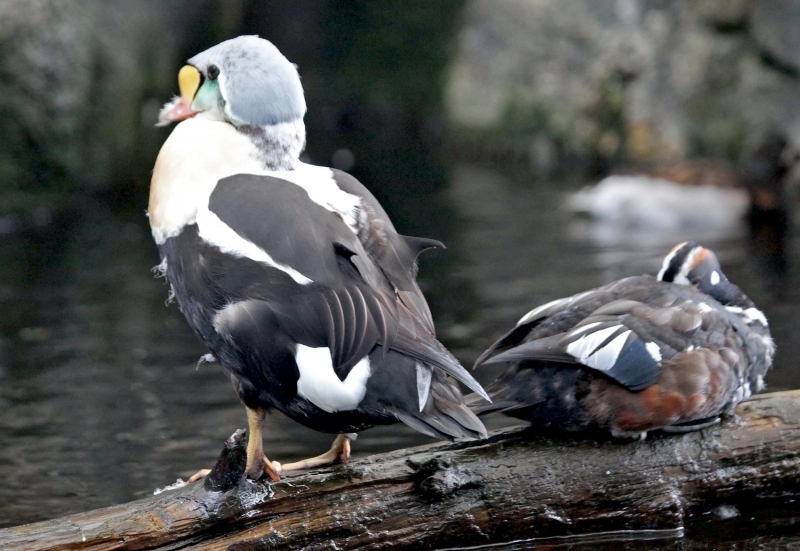 The rest of the body including his tail is black, except for white patches at the base of the tail and white wing patches. 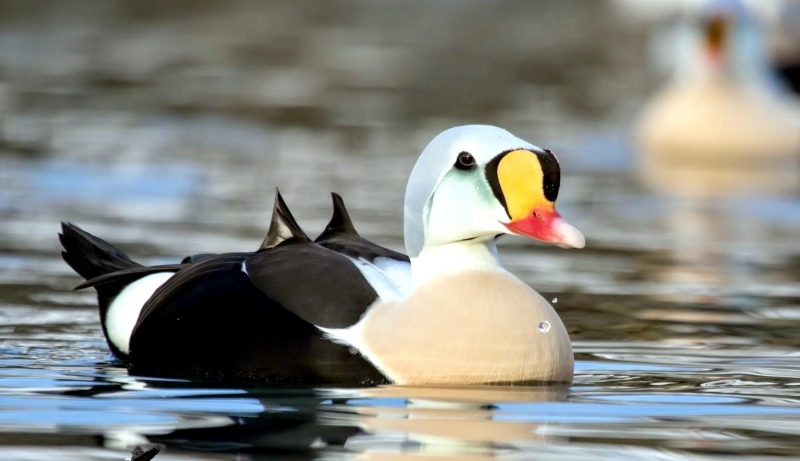 The King Eider has two small black “sails” or upper wings that stick up from his back. The legs & feet are dull orange and in non-breeding or eclipse, the male is brownish-black overall but retains the white patch on his upper wings. 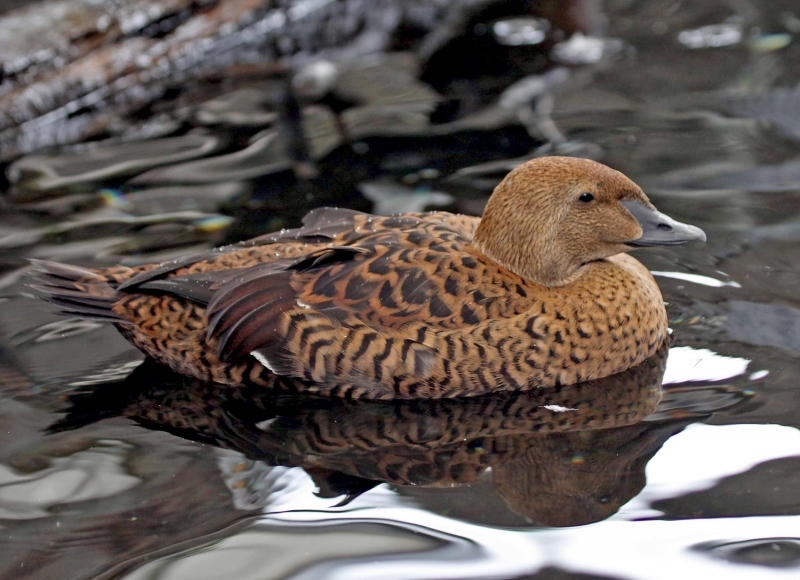 The female King Eider sometimes called the “Queen Eider”, is a warm rufous-brown color with black chevrons on her upper parts and flanks. 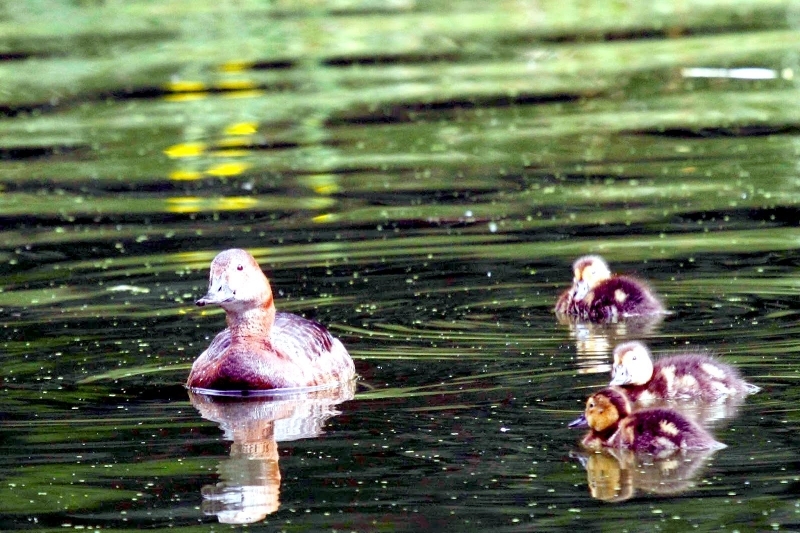 Both her head and neck are cinnamon-brown and finely streaked with black. She has a pale buff-colored eye ring and a down-curving rear eye stripe. She has a dark gape line at the base of her bill. Her bill is shorter and rounder and has less feathering along the bill. Her wings are dark above with a thin white strip along the tips. She has pale under parts. Her legs & feet are greenish. 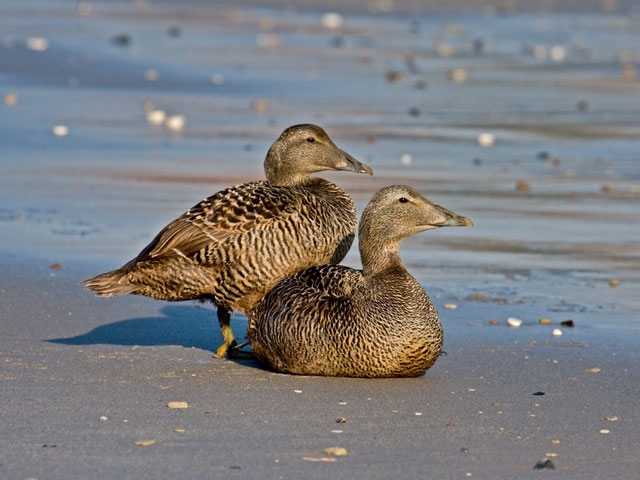 The juveniles are dull gray-brown with a light breast and a dark brown head; they have scaly patterns on their under parts with an upturned “grinning” look to their bills. 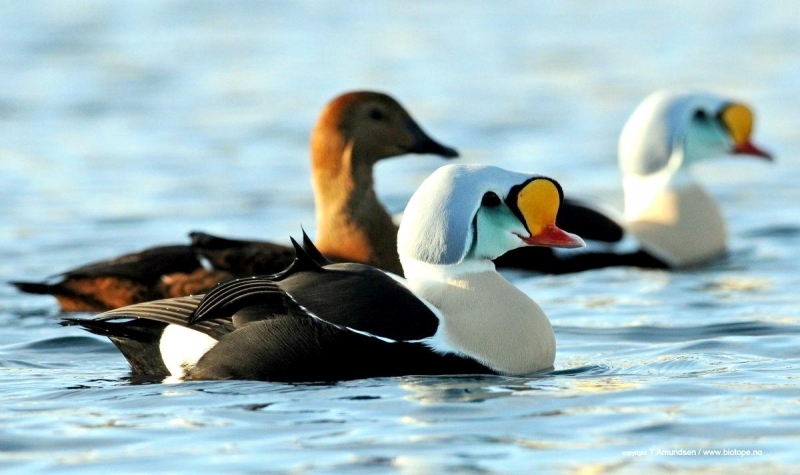 The young male King Eider begins to show white on his chest in late autumn. The white varies as he becomes an adult and he becomes darker above. Full plumage is completed at three years. 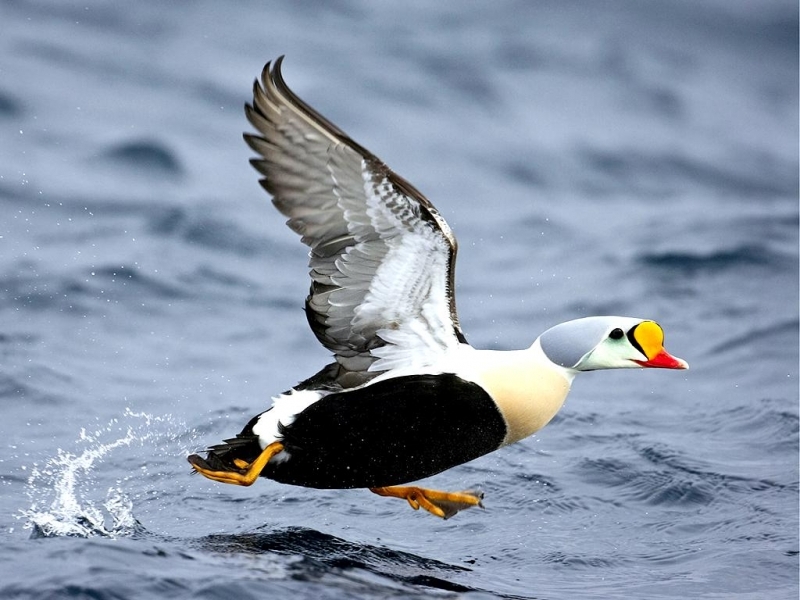 The King Eider is found the arctic regions of the Northern Hemisphere. 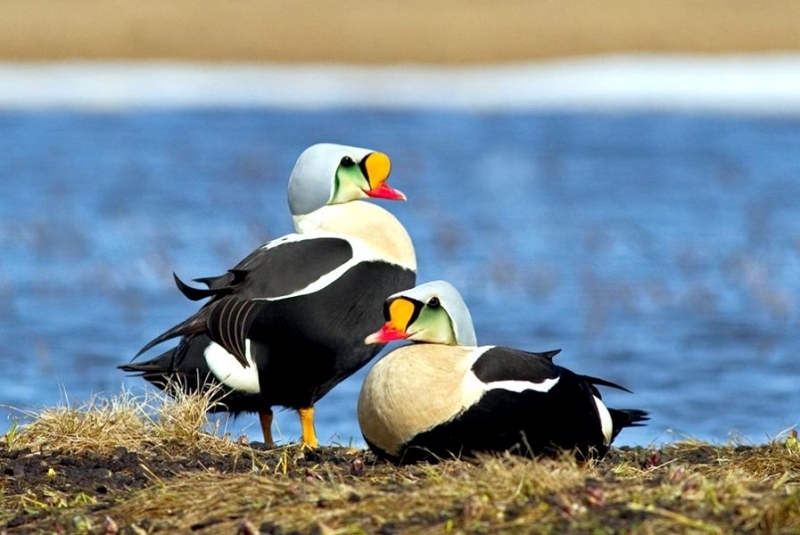 You will find them in northern Alaska, northern Canada, on the coasts of northern Greenland and arctic Russia along rocky coasts, inlets & tundra pools. 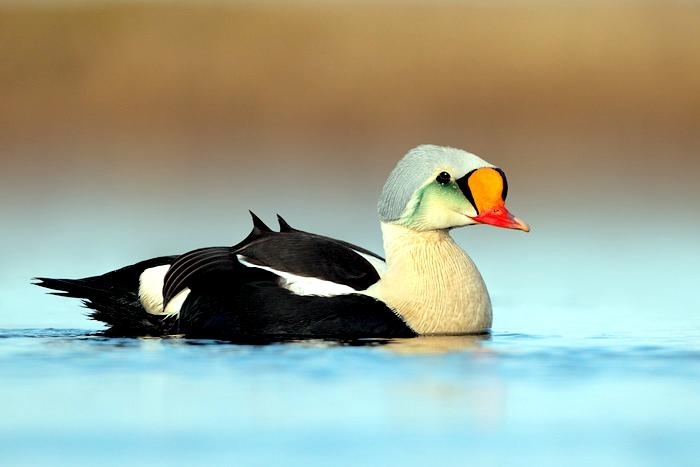 They are partial migrators and migrate in huge flocks in the spring. 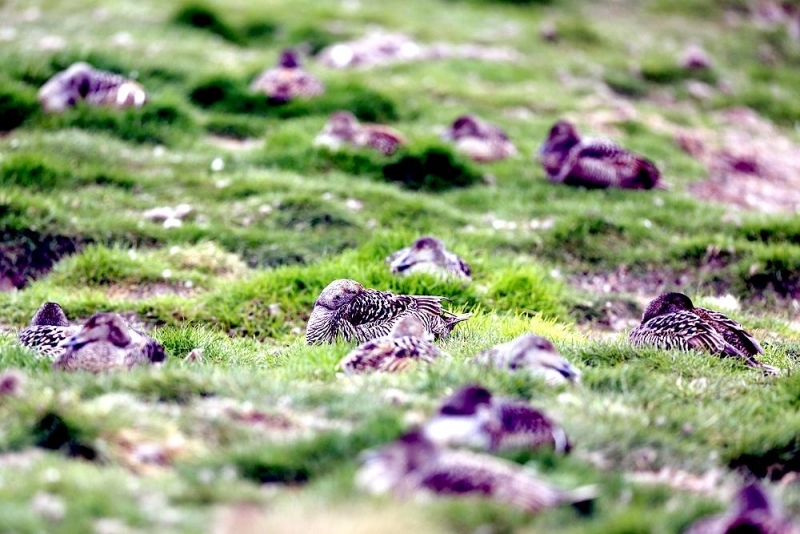 The flocks sometimes consist of all males or all females. 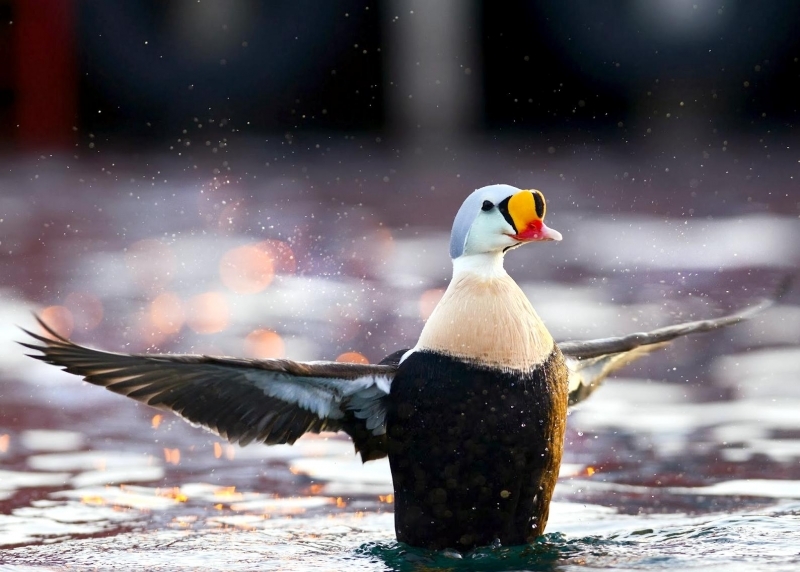 They spend most of the winters at sea in the Arctic Circle. 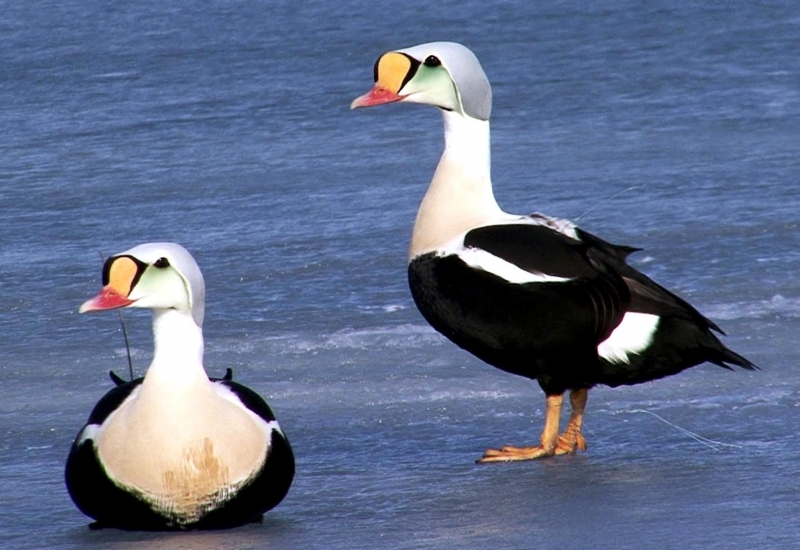 Their plumage gives them protection against the cold. 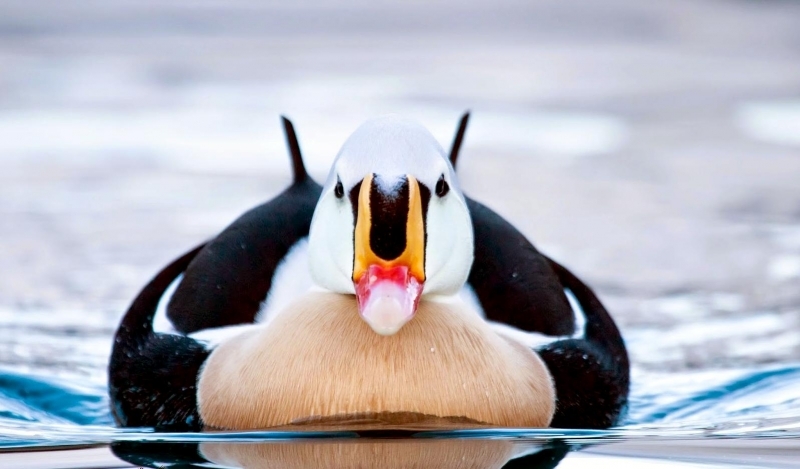 The King Eider has a circumpolar distribution. 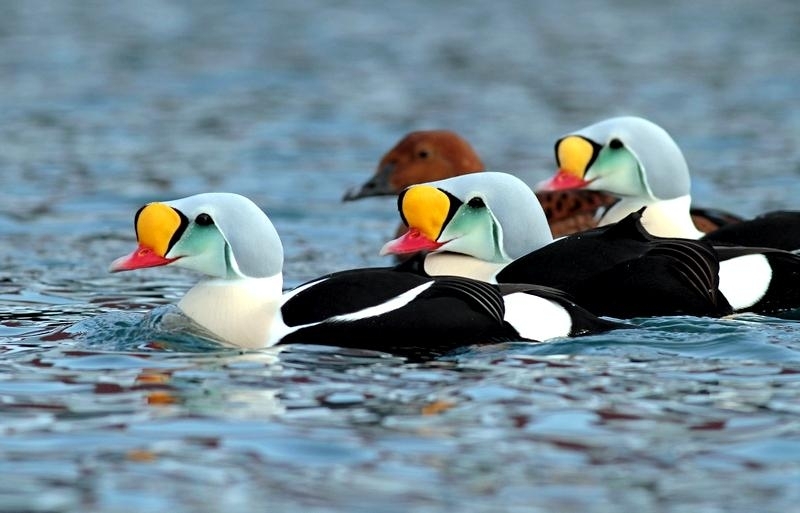 In North America, it breeds along the Arctic coast from Alaska to Greenland and along most of the northern Hudson Bay shoreline. 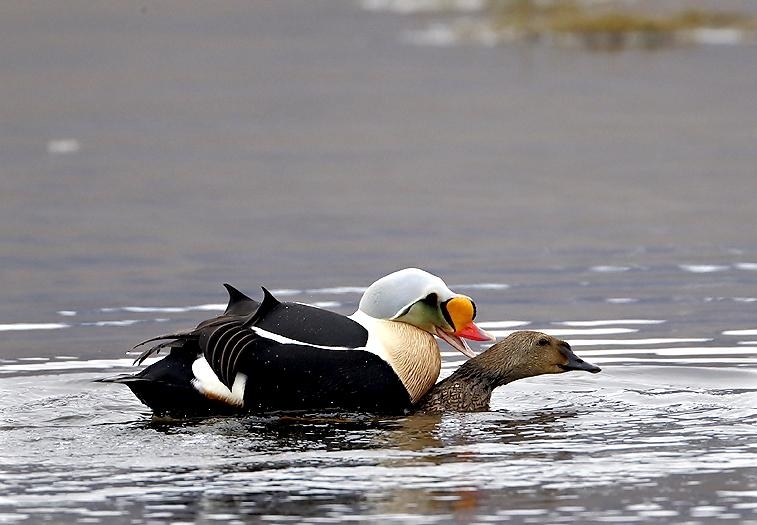 King Eiders generally nest in vegetation, often adjacent to small lakes and ponds or on small islets on the coast. 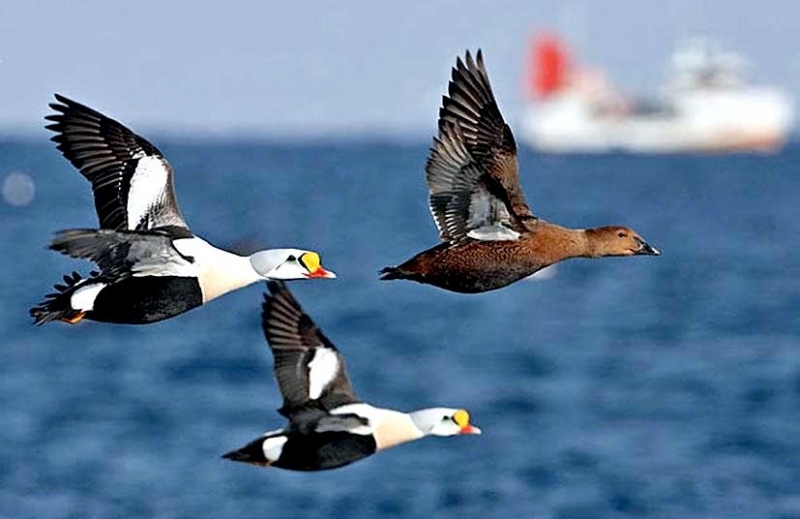 The western migration corridor for the King Eider extends from the coast of Alaska to the Adelaide Peninsula in Canada. In the east they travel from Southampton Island, Boothia Peninsula and Ellesmere Island to the southwestern coast of Greenland. They winter as far north as the seas remain ice-free. 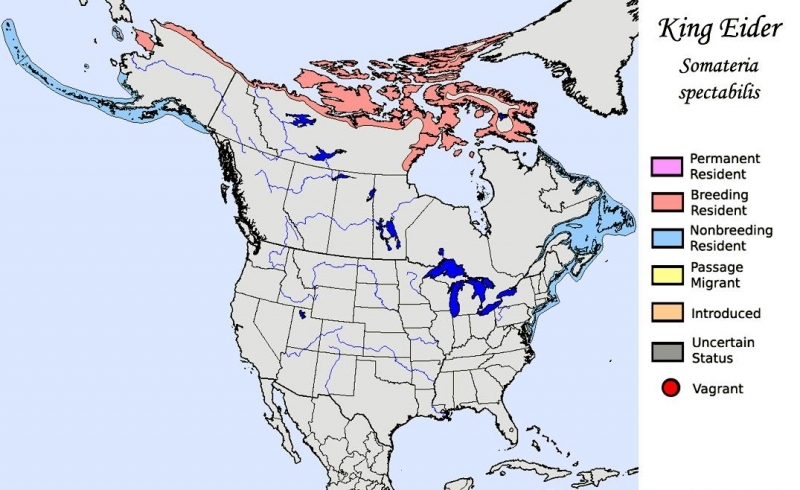 The majority of the western population winters at sea along the Alaska Peninsula and Aleutian Islands, with rare sightings off British Columbia & California. 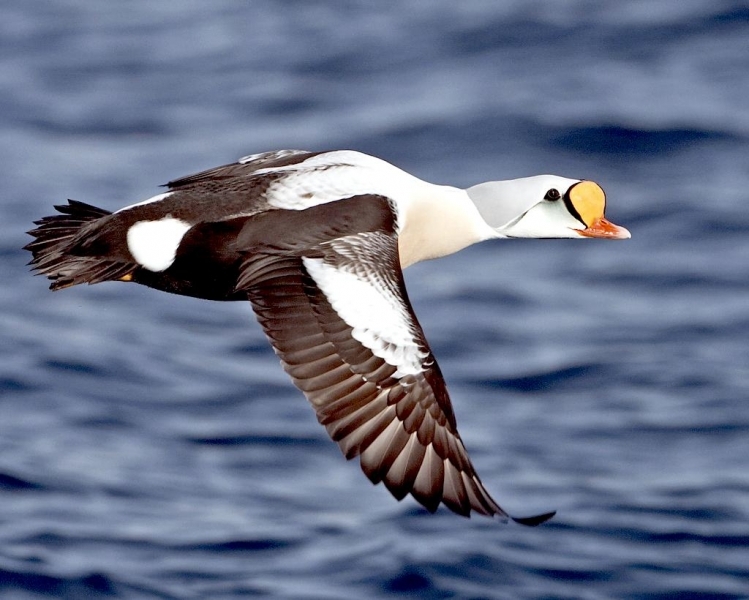 The eastern population winters off the coast of southern Greenland, Labrador, Newfoundland and New England and occasionally as far south as Florida. 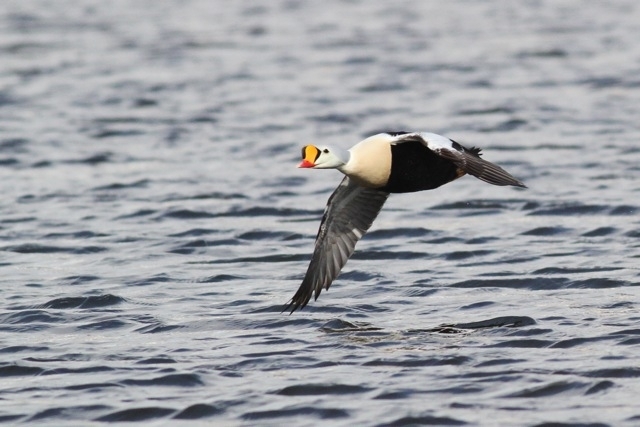 Recent migration counts from the mid-1990’s provided an estimate of 375,000 birds. There are occasional, dramatic population fluctuations that may be the result of the late breakup of sea ice, severe weather conditions or starvation periods. Due to the remoteness of their range, little is known about the current population status. 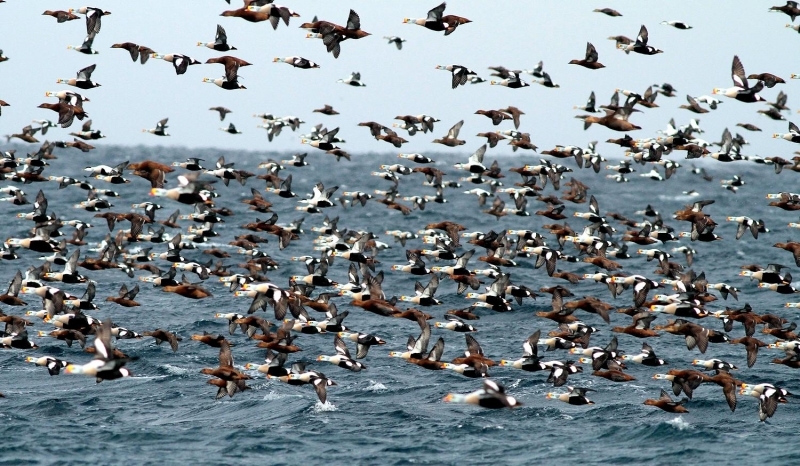 However, counts of migrating individuals in Alaska suggest a decline of 56% since the mid-1970’s. 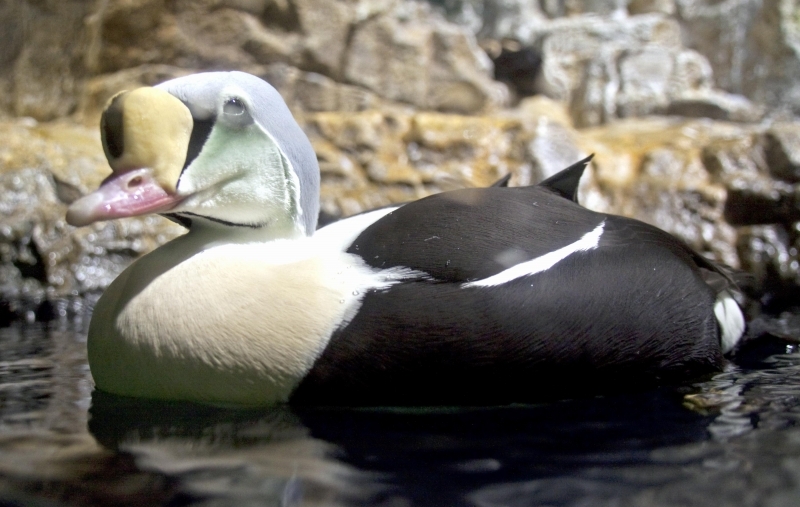 King Eiders dive great depths to feed on mollusks, crustaceans, sea cucumbers & aquatic insects. 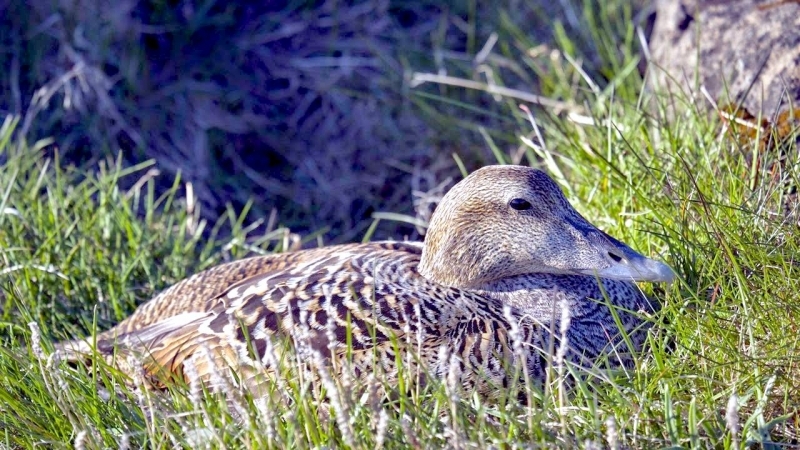 They also feed on eelgrass, wigeon grass and algae. 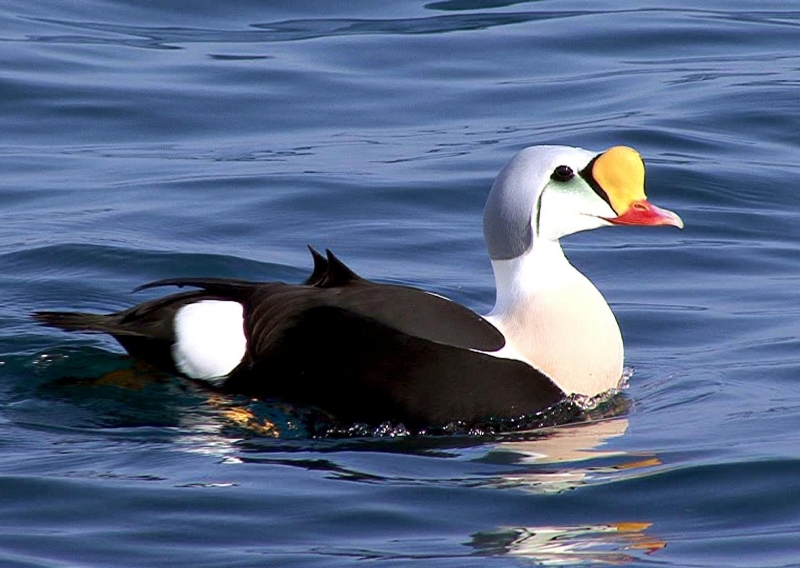 There is a record of one King Eider feeding on the bottom in 30 fathoms (180 feet) of water in the Bering Sea. 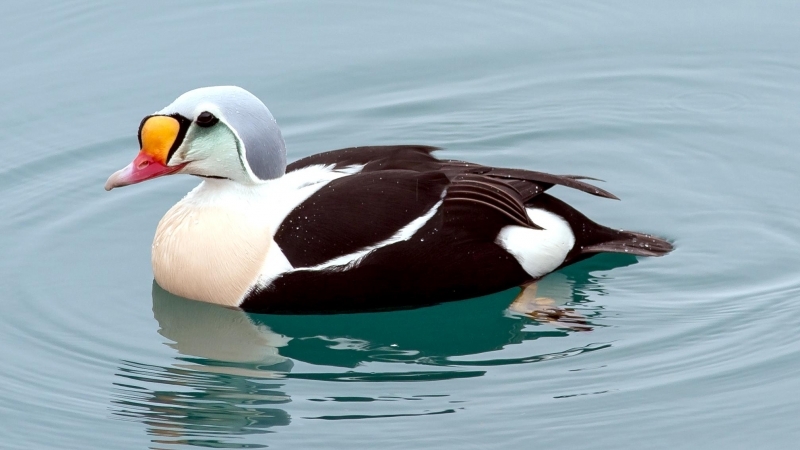 King Eiders are gregarious birds and gather to feed in the coastal waters, but they do not mix freely with other birds. 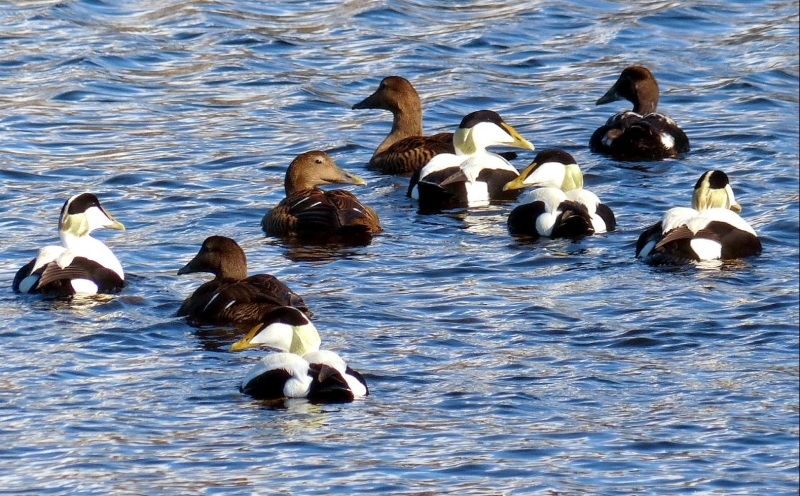 They can be seen holding their bills horizontal to the surface of the water. 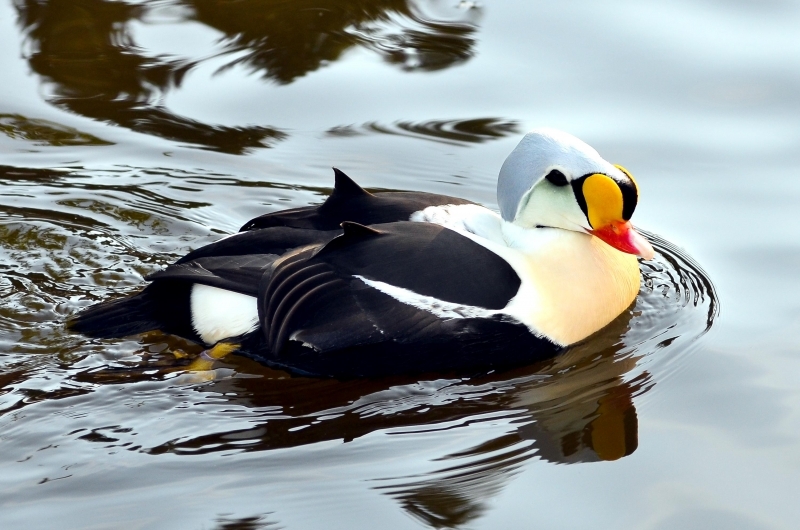 During breeding, they feed on insects and crustaceans. They use their wings to “fly” under the water. 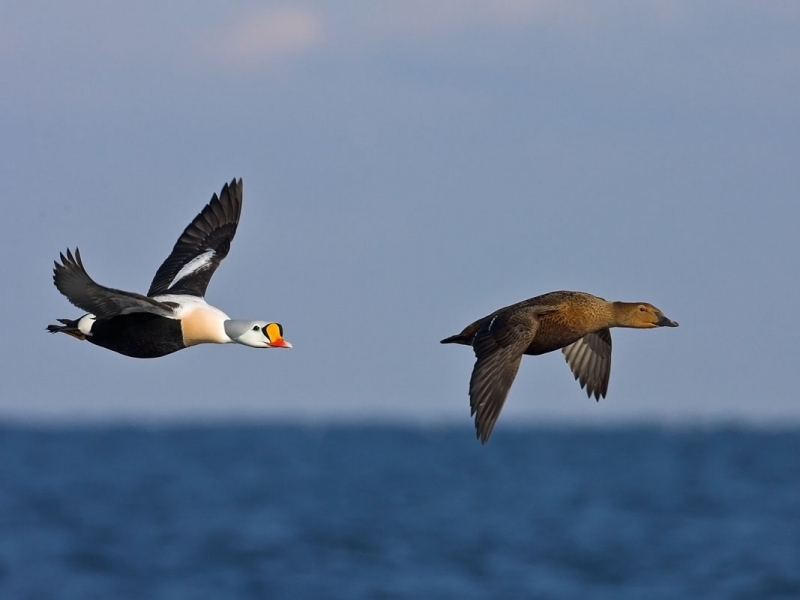 The female has a higher pitched voice than the male. She makes a sound like “gogogogo”. 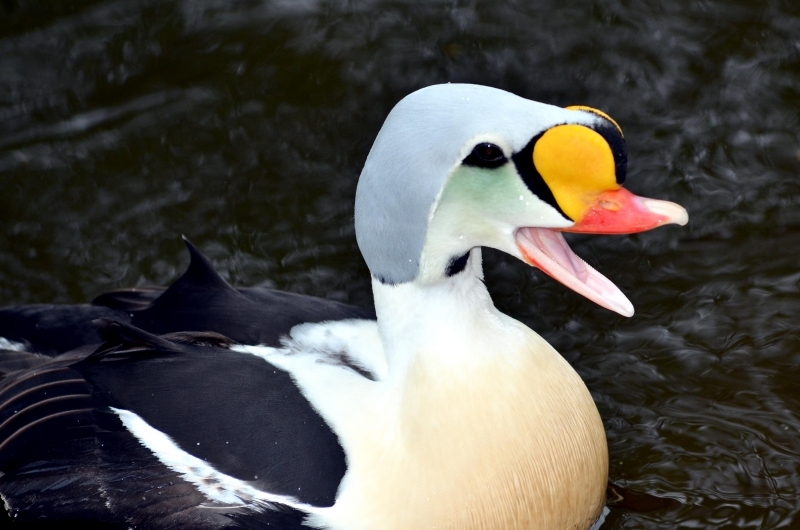 The male makes crooning notes and chuckling noises. 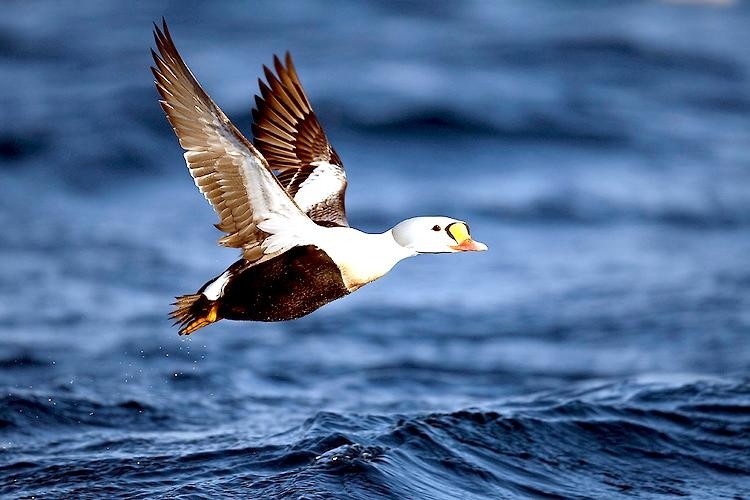 King Eiders fly in a direct course and have rapid wing beats when they fly. 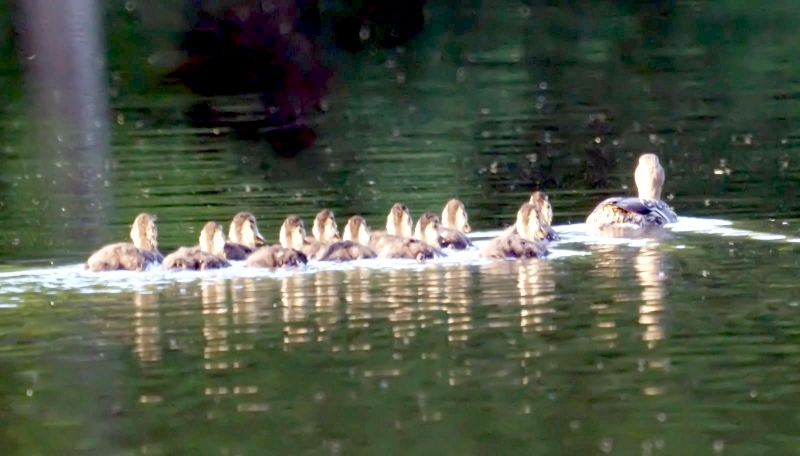 They can be seen flying abreast in long lines, instead of flying one behind each other. 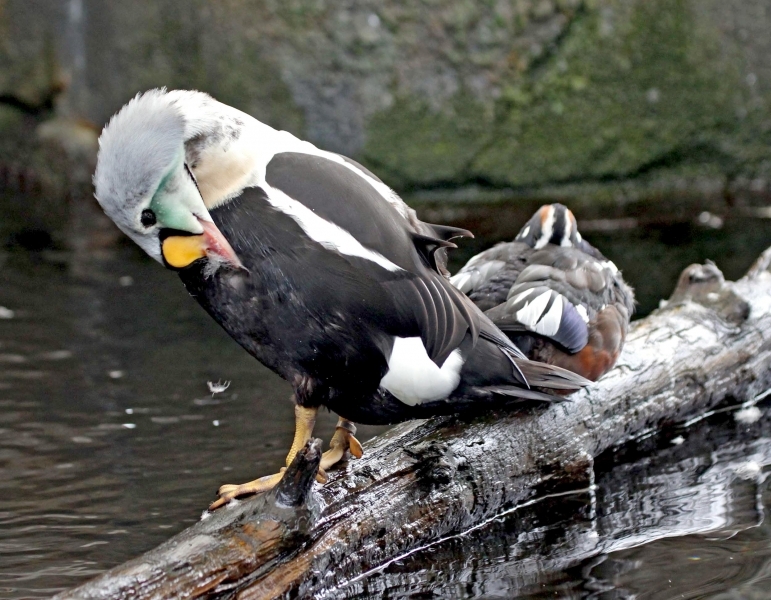 They are best known for their downy feathers which were once used for making bedding. 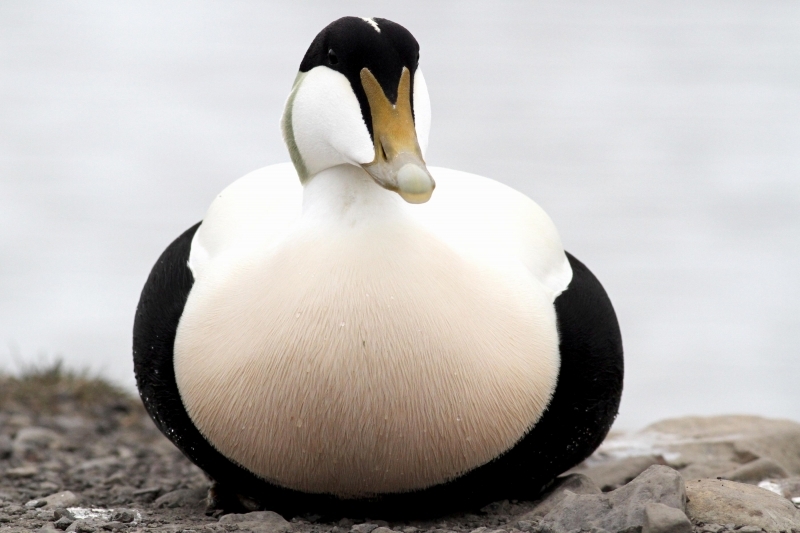 King Eiders breed from November to April. 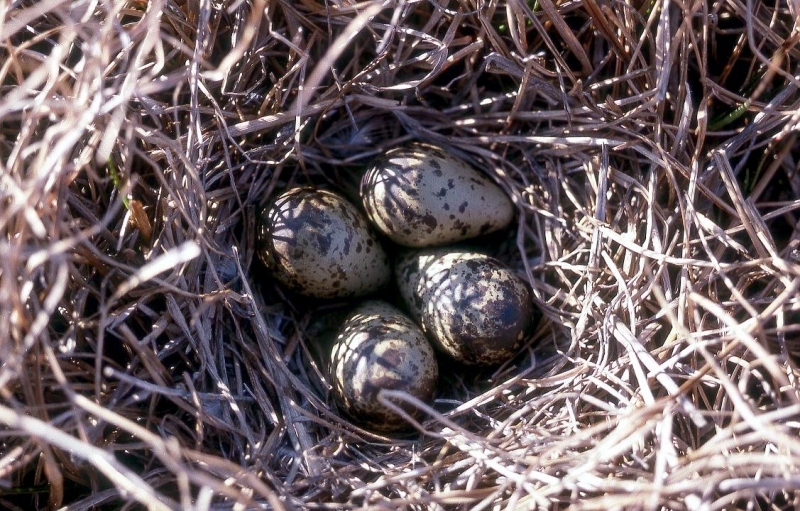 They form individual pairs before they arrive at the nesting areas. 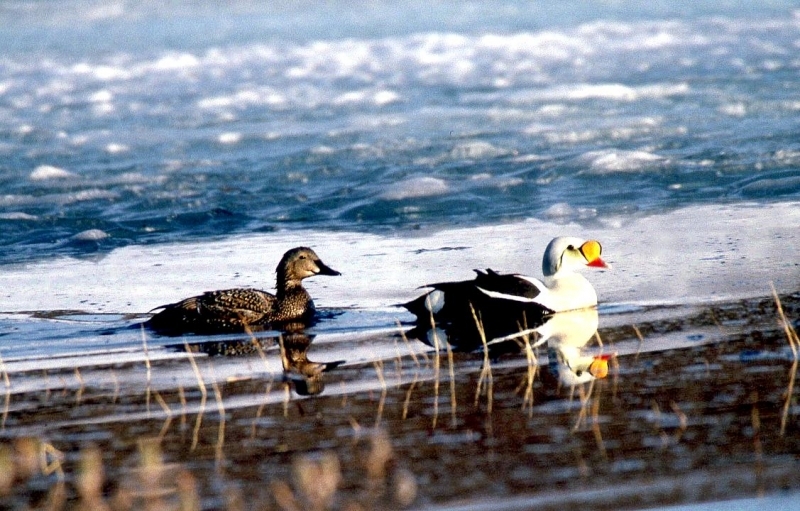 They breed near freshwater tundra pools. In his dapper breeding costume, the male is ready for his breeding display. First he shakes his head and tosses his bill vertically. Next, he entices the female with soft coos & moaning sounds. Finally, he alternates the chin-lifting with neck stretching; he stretches his neck out to her and then quickly returns his neck to a resting position. 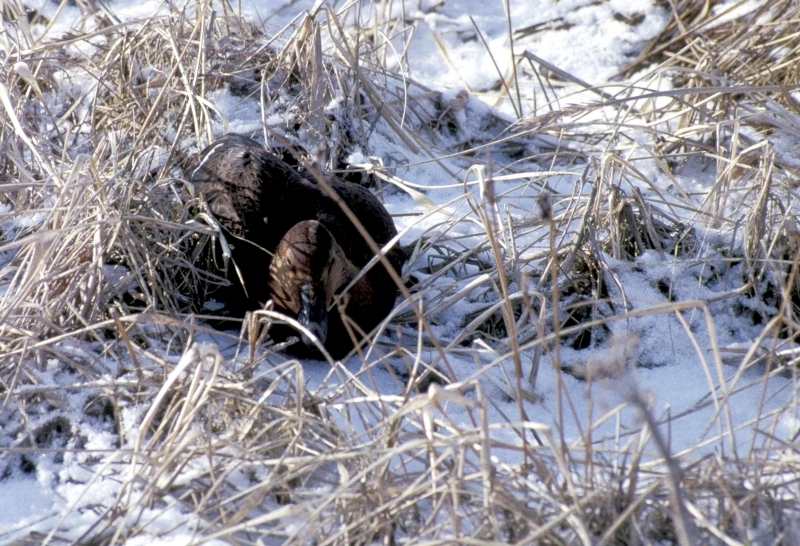 After mating, the female scrapes a depression in a raised portion of ground near the water. She lines her nest with plant matter and down feathers. 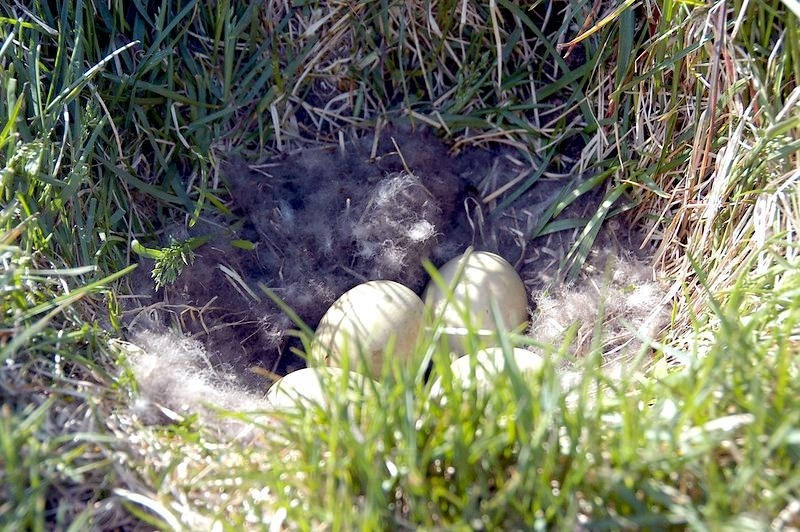 She lays 4-5 eggs in her nest. At this point the male returns to sea. The female plucks her own abdominal feathers out for lining her nest. 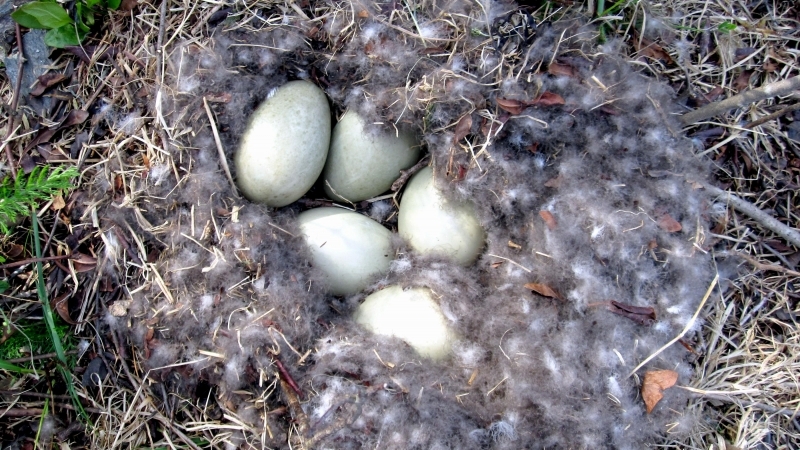 She carefully covers her eggs with a thick layer of down when she goes out at night to find food. 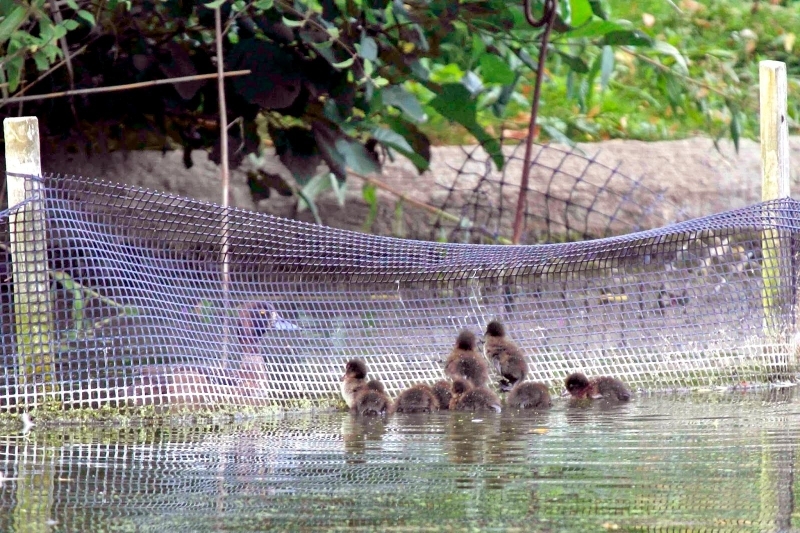 Without this covering, the eggs would cool off and the developing chicks would die. 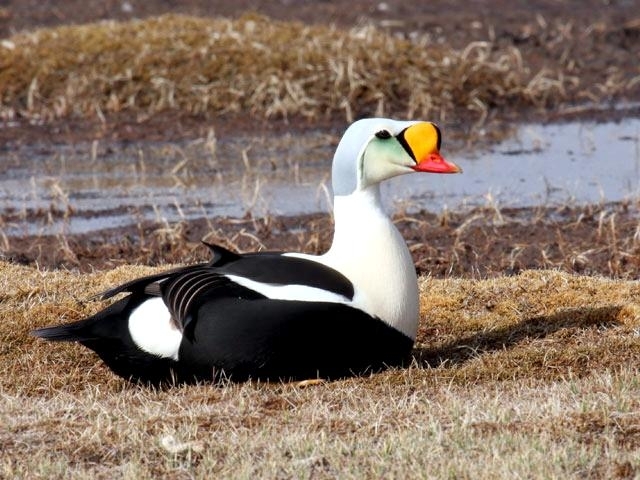 The female King Eider incubates her eggs for 27-30 days and will tend to her young until they leave the nest and are able to find food on their own. 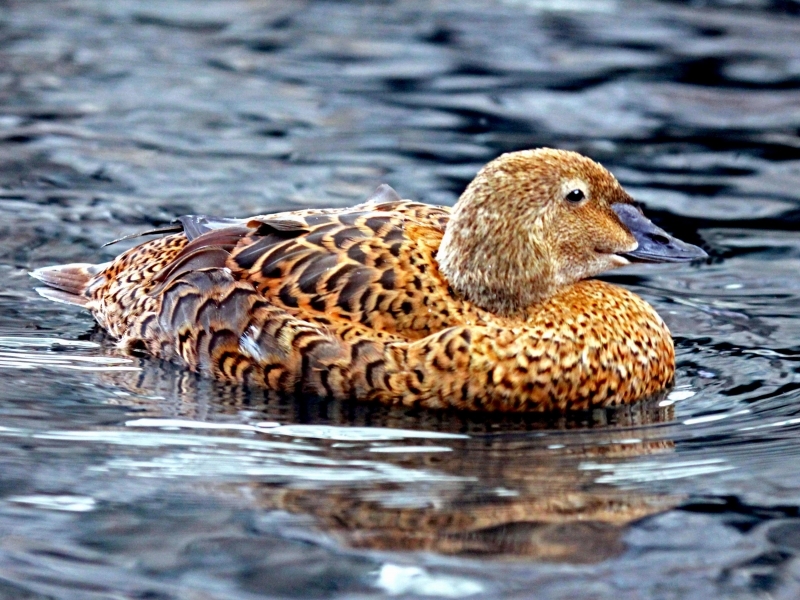 Many females move to the sea before the chicks have fledged.